EfW Building - containing waste bunker, incinerators, boiler hall, electricity turbines and gas treatment area. Bulky Waste Facility (BWF) Building - a single storey portal frame structure adjacent to the main EfW building. The roof steelwork supports a flat standing seam composite steel panel roof which in turn hangs from the external trusses. The end walls are glazed to reveal the structure's bracing and the clarity of the single clear span over the process within. The profiled metal cladding to the long elevations is supported by seven lines of bespoke cladding/wind rails over the height of the building. These rails have feature openings and remain exposed beyond the line of the cladding to create patterns in light and shadow. Two vertical Macalloy bars restrain the rails at mid-span and connect back to the main roof structure. 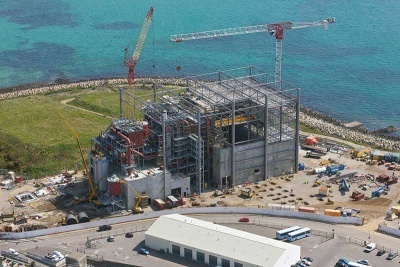 Full operation commenced in May 2011, with the new facility providing up to 7% of the island's electricity.